January. The time for everyone to decide that times need to change. My most popular stickers in the shop these past few weeks have been ‘no spend’ and fitness stickers. Very telling, huh? Look Fantastic know what the usual trend for January is and have made the most of it this month with a detox themed box. I loved the look of this box upon opening. As someone who uses less make up I always like to see a box with only a small amount of make up. 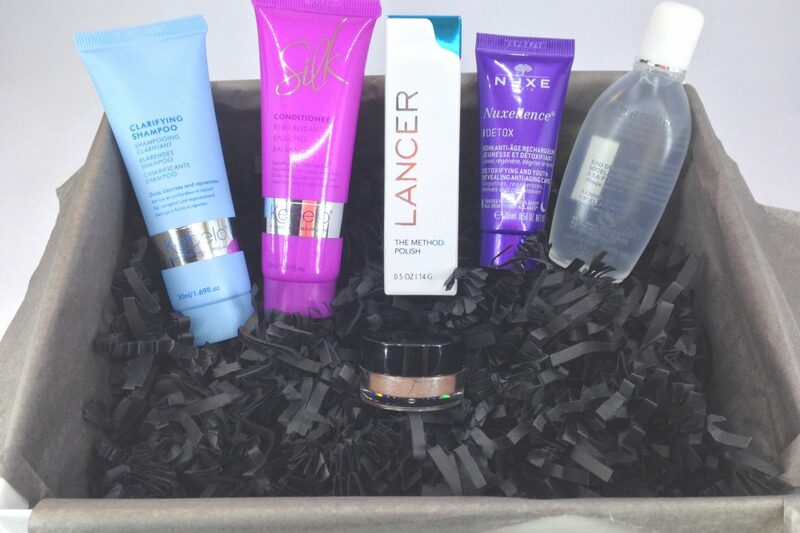 There’s a really great selection in this month’s box and I always like to see a box without hand or body moisturiser! First up is the hair care courtesy of Kebelo. This is a brand I’ve received from Look Fantastic in the form of a hair mask which I wasn’t overly impressed with. However, I love a good clarifying shampoo so I was eager to try this. The shampoo is nice to use, smells lovely without being overpowering and does make my hair feel squeaky clean. However, it makes my hair feel quite dry and so the inclusion of the conditioner was very welcome. My hair did feel nice and soft after use but it really did feel heavy. Which is almost the opposite of what it claimed to do – after using the clarifying shampoo the conditioner claimed to add bounce to the hair without weighing it down. I did find that using this conditioner I had to wash my hair everyday which isn’t something I want to continue doing. Next is this Bellapierre eyeshadow and this is another brand I’ve received in a LF box before. I’m not a big loose powder eyeshadow person but seem to be accumulating them recently. This looks nice in the pot but on the skin it’s overwhelmingly shimmery. To the point where I can’t really see any colour other than a gold shimmer. As with the last Bellapierre product I received this item does strike me as slightly cheap feeling from a packaging point of view. Although the size of the tube is on the small side, I was looking forward to using the Dr Lancer Polish and I love this exfoliator! It reminds me of an exfoliator I’ve used in the past. It’s a white, nice smelling polish and the exfoliating bits inside are tiny. It says to use a pea sized amount which I was dubious of but a little actually does go a long way. The effect after use is skin so soft I caught myself stroking my face afterwards! I do have a full size Liz Earle exfoliator to use but when that’s used I will be buying more of this. This Nuxe Detox Serum is a nightime serum that I’ve been using for about a week now and am really liking. With such skincare it’s hard to see instant effects but in general I would say my skin is looking perkier when I wake up. This product isn’t actually listed on the Look Fantastic website but I found it for £48 on Feel Unique and I would actually be tempted to buy this when I’ve used my evening skincare stash. The Darphin Micellar Water was another product that I was excited about, partly because I needed some more cleansing water. This is another lovely smelling product (this box was full of them!) and I liked the feeling of clean after using it. This is another product I couldn’t find on the LF website but on Darphin’s website I found it for £25 for 250ml. I like it, but I’m not sure it’s worth 5 times the amount I pay for my usual Garnier Cleansing Water. Overall I really liked this box. Kebelo and Bellapierre are fast becoming two brands that are ‘no nos’ for me, but I’ve received some nice products this month and one I’d definitely repurchase.